We have a new Saint in the Catholic family today. I am so proud that St. Teresa has finally received the holy honor she deserves. It’s a long process to achieve the Sainthood but I could not be happier about it. At Church this morning we all prayed to her and we also prayed for everyone to receive her love and blessings. On 10 September 1946, Teresa experienced what she later described as “the call within the call” while travelling by train to the Loreto convent in Darjeeling from Calcutta for her annual retreat. “I was to leave the convent and help the poor while living among them. It was an order. To fail would have been to break the faith.” One author later observed, “Though no one knew it at the time, Sister Teresa had just become Mother Teresa”. She began her missionary work with the poor in 1948, replacing her traditional Loreto habit with a simple white cotton sari decorated with a blue border. Saint Teresa adopted Indian citizenship, spent a few months in Patna to receive a basic medical training in the Holy Family Hospital and then ventured out into the slums. Initially, she started a school in Motijhil (Kolkata); soon she started tending to the needs of the destitute and starving. In the beginning of 1949, she was joined in her effort by a group of young women and laid the foundations of a new religious community helping the “poorest among the poor”. It began as a small congregation with 13 members in Calcutta; by 1997 it had grown to more than 4,000 sisters running orphanages, AIDS hospices and charity centres worldwide, and caring for refugees, the blind, disabled, aged, alcoholics, the poor and homeless, and victims of floods, epidemics, and famine. 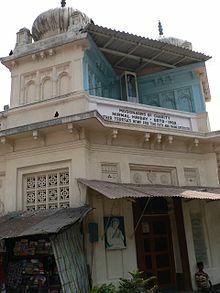 2007 image of Mother Teresa’s Home for the Dying, Nirmal Hriday, in Calcutta. Saint Teresa soon opened a home for those suffering from Hansen’s disease, commonly known as leprosy, and called the hospice Shanti Nagar (City of Peace). The Missionaries of Charity also established several leprosy outreach clinics throughout Calcutta, providing medication, bandages and food. The congregation soon began to attract both recruits and charitable donations, and by the 1960s had opened hospices, orphanages and leper houses all over India. Mother Teresa then expanded the congregation throughout the globe. Its first house outside India opened in Venezuela in 1965 with five sisters. Others followed in Rome, Tanzania, and Austria in 1968; during the 1970s the congregation opened houses and foundations in dozens of countries in Asia, Africa, Europe and the United States. Very interesting story and choice to live her life in service of God and to all others. I am proud to be Catholic. I do not agree with all of our teachings and morality. But I also believe that my Faith has gotten me to where I am today. I just love God. Without God I always feel lost. I’m happy we get today. We can celebrate St. Teresa and remember her good works. She will always be someone I look up to. She is a hero to me and I love her. I hope to be more like her and follow her example. God bless you all! I love ya’ll and I hope you have a good Sunday. We are going shopping with the boys. We had our first Cubs game yesterday. I was on Dad duty more than I got to watch the game but that’s okay. Because all of the Cubbie fans were so awesome to help me out and also keep me updated on what was going on while I walked one or both of the boys back and forth. They had fun and we took a lot of really cool photos. I put them on Facebook this morning. Great guys day with my boys and my friends! We will do that again next year. I want to make it a tradition.